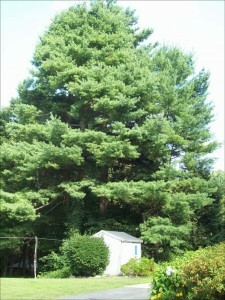 A stand of three mature and stately Eastern White Pine trees watches over the back lawn, driveway and woodlot (shown here in the context of the garden shed). The lowest branches are about thirty feet from the ground, so even with my 28′ ladder, it would be tricky to climb any of them safely, tempting as that may be. 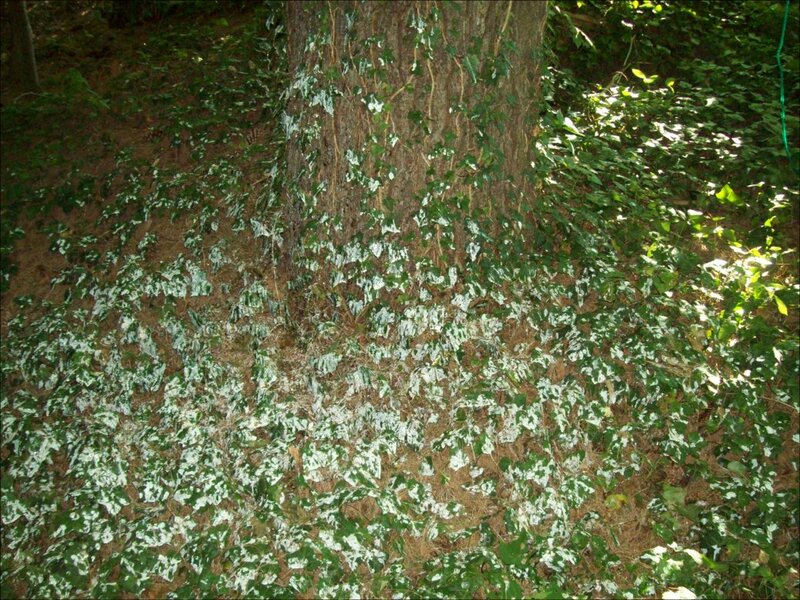 The largest of the three is dropping what seems like an excessive amount of sap onto the ivy surrounding its trunk. Hardened drips of sap cover the Southeastern branches as far up the tree as I can see. 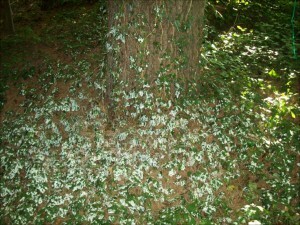 Does the tree have some damage that’s causing such a big flow of sap? I climbed up my ladder hoping to get a better view of the upper reaches of the tree, but only surprised what may have been a White Breasted Nuthatch. This bird may be nesting in the tree or using it to store or crack acorns. Maybe there’s a connection due to drilling done by this bird and a wound in the tree? The trees drop needles that acidify the soil below their crowns, which stunts the back lawn grass growing below that needle-drop.